From the time she was a baby, Dr. Ann grew up under chiropractic care. In junior high, she recalls telling her friends that she was going to get adjusted. They didn’t always understand why Dr. Ann would need to be adjusted, but she remembers thinking, “Doesn’t everybody do this?” She just knew that chiropractic was something that was good for her and it was something she wanted to do for a lifetime. Dr. Ann pursued her chiropractic education at Palmer College of Chiropractic in Davenport, where she graduated in 2002. While attending Palmer, she participated in a clinic abroad trip and found it inspiring to see the tremendous gratitude, hope and joy in the people they were blessed to serve in that time. To this day, seeing those same feelings in her patients gives her the motivation to continue seeking ways to serve and help them in every way she can. For Dr. Ann, chiropractic isn’t a quick fix, but instead a change in one’s mindset and lifestyle. “The biggest directional shift for me was when I found myself in the early stages of an autoimmune issue. It gave me an opportunity to put into practice all the things I had learned and known from a holistic lifestyle perspective.” She saw a big change in herself, and her experience has allowed her to help many people beyond just the chiropractic adjustment. It was a big challenge that ended up giving her knowledge and resources, as well as a heart, to educate and empower people to know that they too have the ability to maximize their own health potential. 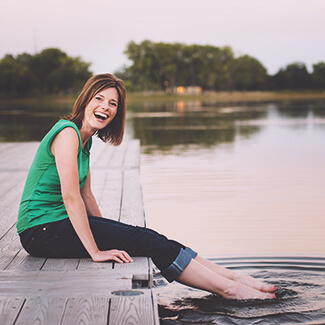 When she’s not at Abundant Life Chiropractic in West Des Moines caring for her patients, Dr. Ann loves traveling, spending time with her family and friends, cooking, reading, decorating, and she particularly enjoys outside activities such as running and being near the water. She is a member of the Iowa Chiropractic Society. If you’d like to experience optimal health and wellness, we invite you to schedule an appointment with Dr. Ann today!